I bet you didn't know that you can reopen a Firefox tab you have closed. Let's say for instance you closed a Firefox tab, but remembered you needed information from it immediately after closing it, or possibly you closed it by accident. 1. Click the Red "X" or type Ctrl+W to close this tab. 2. 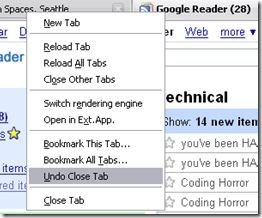 Right click on one of the other tabs and select [Undo Close Tab]. 3. And Yes! It's back! The shortcut for this is Ctrl-Shift-T (in contrast to Ctrl-T for a new tab). Very useful indeed, if you've mistakenly closed a tab. Or Apple+Shift+T on a mac. Thank you, that's awesome! Ctrl+Shift+T is the shortcut key for Windows. I didn't know what it was yet.